Step 1: Mix yogurt, mint, lemon juice, oil, honey, and garlic in a small bowl; season with salt and pepper. Cover; chill. Step 1: Grate zucchini, potato, and onion on the large holes of a box grater. Transfer to a mesh sieve set over a bowl and toss with 2 tsp. salt. Let vegetables sit until they release their liquid, 30−40 minutes. Step 2: Mix eggs, garlic, cumin, 3 Tbsp. parsley, and 2 Tbsp. mint in a medium bowl; season with salt and pepper. Gather up half of zucchini mixture in a kitchen towel; squeeze out excess liquid. Add to bowl with egg mixture and repeat with remaining zucchini mixture. Sprinkle flour and baking powder over; mix gently. Step 3: Heat vegetable oil in a large skillet over medium-high. Working in batches, spoon scoops of mixture into skillet, flattening gently with a spatula. Cook until golden brown and crisp, about 3 minutes per side. Transfer to a wire rack; season with salt. Drizzle yogurt sauce with olive oil and top with more herbs; serve alongside warm fritters. 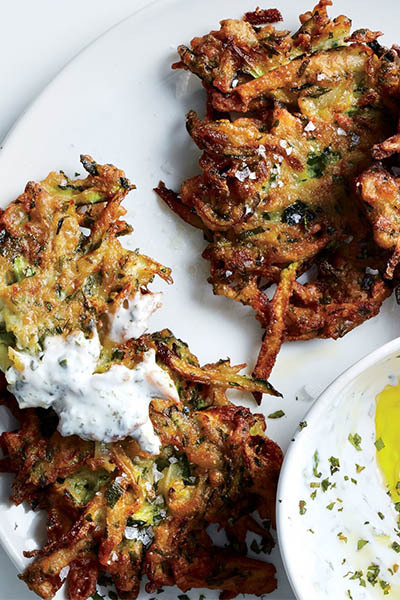 Enjoy these Zucchini-Herb Fritters with Garlic Yogurt from BonAppetit!